This midcentury French solid elm wall sconce was originally placed under a ceiling beam for support and features a hand carved medieval figure. Dressed in a simple robe, the medieval man rests his head on his left hand in a pensive pose while his right hand lays in his lap. 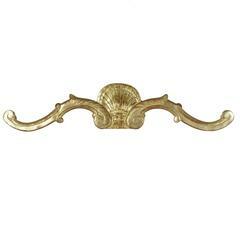 Signed with the initials of the artist TM, this hand carved sconce would make a wonderful three dimensional wall sculpture, circa 1950. Pair of 20th century Indian carved and painted architectural transoms. Listed is a stunning, pair of early 20th century architectural reclaimed raised-tin tole wall plaques. Beautiful, patina on all sides. Can be hung vertical or horizontal. Beautifully hand carved wood wall hanging, French decorative motif Very detailed, look great as wall hanging, could use horizontal or vertical. Late 19th-early 20th century continental handmade iron bell Measures: 11.5" W x 7.25"D x 29" T, 24"T without ringer pull.